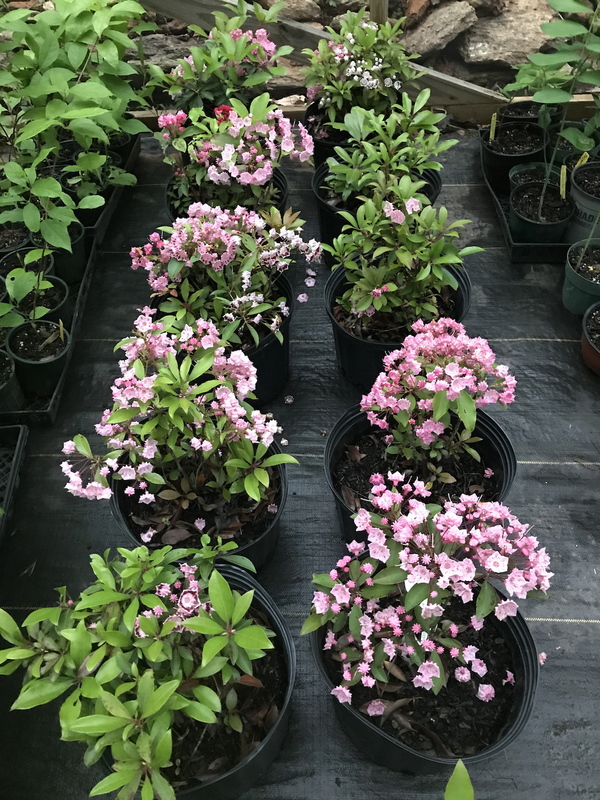 Kalmia latifolia, or mountain laurel, is a handsome, broadleaved evergreen shrub in the heather family, the Ericaceae. It is native to the eastern United States and its range stretches from south Maine south to northern Florida, and west to Indiana and Louisiana. It is the state flower of both Connecticut and Pennsylvania. As an evergreen shrub growing to 3–9 m tall, The leaves are 3–12 cm long and 1–4 cm wide. Its flowers are round, ranging from light pink to white, and occur in clusters. There are named cultivars today that have darker shades of pink, near red and maroon pigment. It blooms in May and June. All parts of the plant are poisonous, but it is not exactly something that you would eat, now is it?. Don't use the wood for roasting marshmallows. It's roots are fibrous and matted. The species is naturally found on rocky slopes and mountainous forest areas. It thrives in acidic soil, preferring a soil pH in the 4.5 to 5.5 range. The large shrubs often grow in large thickets, covering great areas of forest floor. In the Appalachians, it can become tree-sized but is more of a small shrub farther north. The species is a frequent component of oak-heath, and hemlock forests. In low, wet areas, it grows densely, but in dry uplands has a more sparse form.